So I know the general consensus is hero's aren't that good, but I happened to roll 128 Glenn tokens in a 15 radio call. The other choice is a 3* Scout which has dodge/bullet dodge/iron skin, which I know are all favorable traits. Which should I choose? After seeing the Glenn video I say Glenn and he pays xp's with a kill, JMO. I'm going to use the last of my radios on Glenn day since it will take forever to get tokens for any of the others. Might as well get him if I can. I think since I'm only level 14 and still really early game I think having the supply farmer will do a lot for me than a 3* Scout I'll eventually one day boost. Thanks for the input. Yes. Glenn will be a huge service to you right now while still trying to Upgrade Camp. Just remember.. He has to be in Leader spot for his Trait to work!! Yeah 128 was enough to get him 3* and level up traits twice. And also aside from his leader skill his first 2 traits are luck and Dodge which everyone say are essential so I feel like he'll be pretty useful till I'm full of legendaries with those traits. 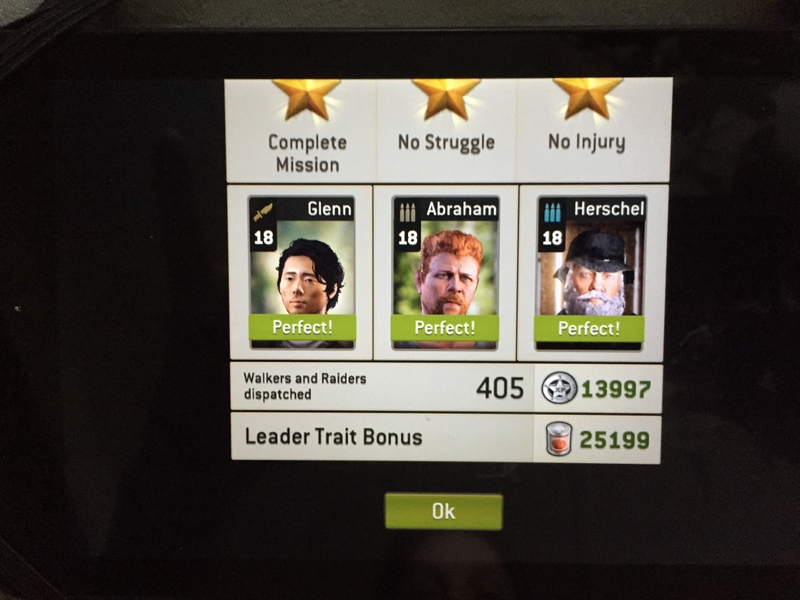 Glenn brings extra XP on Walker kills Also right? I can't quote when posting from my phone. On a PC is fine. @rgerkman what mission were u playing in your pic? Does the 100 max kills effect Glenn's tomato "take home pay" lol?